Prophesying in the church is a part of Christian ministry. It is just as important the uplifting of the Church. However, if you prophesy, it doesn’t mean you’re a Prophet. God can use us all in the gift of prophecy. God will use any Christian who is open and available to the Holy Spirit. You can give a Prophetic word to an individual or the Body of Christ. Have you ever, been speaking to someone, and felt the Holy Spirit was giving you a specific message for them? This may be, a word, the Word of Knowledge, the Word of Wisdom or the Gift of Prophecy in action. This does not necessarily mean you are a Prophet, as ally spirit-filled believers can be used in any of the 9 gifts of the spirit. When God has called you, it is natural to seek confirmation from others. However, you must first know that you are called by God. Why I say this is there will come other who will challenge your call?Hath God said? When you know you have been directly called by your Father, no one can tell you differently! If you are truly called and willing to endure the challenges that lay ahead you will fulfill your call. This is true for everyone whether Sunday school teacher, youth minister, or Prophet. You call may not be recognized by your Pastor, especially if he or she is insecure. Don’t be discouraged, eventually, your call will be recognized and confirmed by others. I started as a young Christian giving words of prophecy to my congregation. This was only the beginning of my Christian ministry. My call began to manifest as God gave me visions, dreams, and words of knowledge to people and discerning of spirits. From time to time, when I went to a special service, I was given a prophetic word that I was call as a Prophet. As I continued in the Lord, I became an ordained minister. Later I was consecrated to the Office Prophet and consecrated. I never called myself a Prophetess. I never put a title on a business card. However, when I finished preaching and ministering, the Pastor of the church said I was God’s Prophet. You don’t have to go around telling everyone you are Apostle, Prophet or Evangelist so and so. When you have finished ministering, everyone will know who you are in God! So, you see eventually someone in leadership will recognize your call. 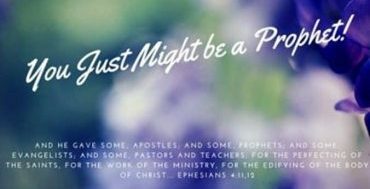 Have you ever wondered if you are called to be a Prophet? Know this, you can not choose to be a prophet, you have been ordained from the beginning of time. Before time and eternity, you were called, predestined to become a prophet! Every life experience, every path walked, was your preparation, for the time you would be set forth in Ministry. You may have one who has walked alone, or has always seemed to be different than others or picked on by others. You be used to walking alone. Great…that is just where the Lord wants you! I was always a little different, lonely even though I had a mother, father, and siblings. I battled depression as a child and teen. I often wondered what was wrong with me. I often felt broken, or a misfit. Even as a minister, I didn’t have many close friends. Little did I know, many called to Christian ministry, particularly the Prophet experienced these things. If you are a believer and feel like this, know that you’re not weird. You just might be a Prophet! Do you get angry when you see sin in the world? Do you get so burdened when God reveals to me what is going on in the Church? Do you feel like you wish God didn’t show you what is going on around you? You may minister words of prophecy and encouragement to others, yet often can’t get a word for yourself. You are sometimes discouraged and depressed. You love God and serve Him with your whole heart. You pray and cry, and cry and I pray. People think I’m weird. What is wrong with me? People may not understand you, but be encouraged my brother, my sister. You’re not weird; you just might a Prophet! Isaiah53:3 He is despised and rejected of men; a man of sorrows, and acquainted with grief: and we hid as it were our faces from him; he was despised, and we esteemed him not. If any of this seems familiar to you, know that you are not alone. Jeremiah cried all the time. He cried for the sins of Israel day and night. He said, “If my eyes were a fountain, I would weep day and night for the children of Israel day and night.” In his discouraged state, he refused to preach or Prophesy again. Isaiah experienced the fear of not being received by others. Samuel had to tell Eli that God was going to wipe out his generation because he refused to discipline his sons. If Jesus endured rejection, so will we. It was said about Jesus in Isaiah 53. ‘He was despised and rejected of man, a man of sorrows and acquainted with grief, and we hid our faces from Him.’ So know that you are not weird, you are not being picked on, it is that you just might be a prophet! He was despised and rejected of man, a man of sorrows and acquainted with grief, and we hid our faces from Him. If Jesus endured rejection, so will we. So know that you are not weird, you are not being picked on, it is that you just might be a prophet! What is a Spiritual Soul Tie? Dear Author of this phenomenon web site, thank you for this deep spiritual insight and guidance that I have been reading about gifts and prophecy identification. I have been going through so much term oil in this recent time that suicide became an option through my very low feeling of rejection. My major problem is in my marriage whereby I gathered my wife having lust for various men. I just could never catch her in the act or God just didn’t want me to bare that witness, hence I’ve lashed out with her in horrible words and even accused her mother for being the curse for the things she done when they were kids in their presence as children. Its gotten so bad for the visions and signs I see around in the house is like torture to my soul. I am very emotional and cry whenever I’m at the throne of the Lord endlessly. At this point I’m trying so hard to satisfy everyone other than myself. But now that I have read through some of your guidelines it became much more clearer to me why I am faced with all of this, that this is my preparation platform for what is to become in time. I will surely follow your teaching for already through grace there are confirmations in what you have said. I am different and most of the time distant from others and just looking into their ways of thinking and doings. Thanking you for your spiritual build up and insight of our lord in Christ Jesus.